Yes, this is the start of the next quadrennial. And it has turned Kirsten Moore-Towers and Michael Marinaro into the senior members of the national pair team heading out to Grand Prix events this season. 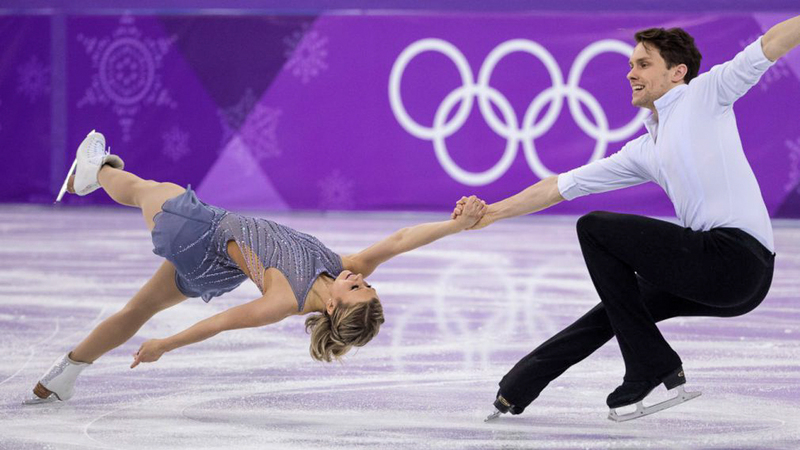 They had a quick lesson in leading the pair show at the world championships last March in Milan when they remained the only Canadian team left standing after the short program – and they had to finish no worse than 10th to allow Canada to send two teams to this year’s world championships. Pressure? They met it, finishing fourth in the free program, sixth overall. And this year for the first time, they are watching 17-year-old Evelyn Walsh step onto the national team with her partner Trennt Michaud. “It’s a little bit scary,” said Marinaro, who skated at the same rink as Walsh at one time. Marinaro used to do ice shows with Walsh when she was a kid. He’d swing the pint-sized slip of a girl around and do head bangers with her. “So it’s a little weird now,” Marinaro said. Marinaro even had a junior pair team that he taught in CanSkate go to a Junior Grand Prix earlier this season. “Definitely feeling dated,” he said. “We hope we are like fine wine,” Moore-Towers said. They would have loved to have drunk in their success at the world championships, but it was not to be. Moore-Towers had injured her right ankle to the point that it became an issue before the world championships. When they did their short program at Milan, it was the first time the pair had actually done a complete run-through of it since the Olympics. The ankle injury has lingered. They learned a lot from that experience. But they are still learning. “We always say that you learn the most from the most difficult experiences,” Moore-Towers said. “You don’t really learn anything when everything goes smoothly. But for us, worlds was really difficult because we were in an unexpected position of being the only team to qualify for the free skate…And I had an injury going on. Since the world championships, Moore-Towers has discovered that her ankle injury was more serious than thought. She actually hurt it at the Olympics. “It was kind of an overuse thing, and it’s been pretty tedious, still in September,” she said at training camp in late August. It has also meant that they have had a short summer. The pair had some shows after the world championships, but then Moore-Towers was off the ice for seven or eight weeks completely, and even off her foot for a while. He stole it a couple of times. He admits it. He rode it around the arena. For just a fleeting moment, he took it outside and rode it out in the parking lot. Moore-Towers got one with big wheels, to increase the safety factor. Moore-Towers didn’t return to training until late June. And when she did, she was not jumping. When she started jumping, she was not doing throws. In July, she had a little setback. She took a wonky fall on a throw and she was off the ice again. “It’s been very frustrating,” she said. And she’s discovering the thing that some of her peers are living through, too. “As we get older and we don’t heal as quickly, I feel I’m frightened now when I have a fall, especially with the bad concussion I had a couple of years ago,” Moore-Towers said. “I know how difficult it can be to recover and hate it. She’s talked to Piper Gilles about it. She and her partner Paul Poirier are both 26 years old, too. “Although we look 17,” Moore-Towers chimed in. And don’t forget that Moore-Towers lost some time a few years ago with concussion problems, which had a very long recovery path. That will happen this week at Autumn Classic in Oakville, Ont., where Moore-Towers and Marinaro will go toe to toe with world bronze medalists Vanessa James and Morgan Cipres of France. With the injury, Moore-Towers and Marinaro worked on their long program choreography with Julie Marcotte in June when Moore-Towers returned to the rink. They started doing the short program in the spring, but when Moore-Towers was taken off the ice, Marcotte took her place on the ice with Marinaro, while his partner watched from the boards. “This one has been interesting because we wanted to take the plunge in the new quadrennial to try something different, to be a different team,” Moore-Towers said. Last year they delivered classical and emotional routines with a great connection. But they want to show they are versatile. The free skate is a learning process. It will take them more time to master. “I think it’s going to be fantastic,” Moore-Towers said. Their short program is a Robert Flack song (“The First Time Ever I Saw Your Face”) but covered by Leona Lewis, a British singer who gained notoriety when she won X-Factor in 2006. Her debut album went ten-times platinum in the United Kingdom and at 33, she’s the second most successful act to come out of the X-Factor Franchise. Stay tuned for her mezzo-soprano voice that can navigate four octaves. They will do another senior B competition – Finlandia Trophy in Espoo, Finland Oct. 4 to 7 before they tackle their Grand Prix assignments: Skate Canada in Laval, Que. Oct 26 to 28 and NHK Trophy in Hiroshima, Japan Nov. 9 to 11. They play with their goals in their minds. It’s tricky to explain. During the summer, Moore-Towers admits her focus had been too much on results and not enough on day-to-day progress. “Because of our setbacks in the summer, it’s been detrimental to our training to be focused only on making [Grand Prix Final in Vancouver] which is, of course a goal, and only on improving our place at worlds, which of course is also a goal. Their end game won’t be the Autumn Classic. And through it all, Marinaro has been the rock of the team, pulling Moore-Towers back when she gets a little too ahead of herself. “Right now, we’re just trying to focus on the day-to-day and make strides every day so that come October and November, we’re 100 per cent,” Marinaro said.